he Regiment of Cacciatori was formed in 1777 after a decision taken by the Chapter General led by Grand Master De Rohan. The best hunters on the island had already been known as the Cacciatori under the command of the Order’s Falconier, serving as gamekeepers in the Grand Masters hunting ground in Bosketto Gardens, since the early 1700’s. Now these men were to be recruited on part-time basis as a militia infantry unit of volunteers under military discipline. The officers, non-commissioned officers and drummers were to be appointed on a regular basis with their scale of pay fixed according to rank. ollowing the decision to form the Regiment of Cacciatori or as it was also known as the Reggimento dei Falconieri, hundreds of Maltese recruits joined this light infantry unit as volunteers, hailing from most of the island’s villages as well as the cities of Valletta and Burmola. In 1778 the Regiment was reorganized into four companies instead of five. This was due to a marked decrease in strength which had gone down to 522 all ranks. An Honorary Colonel was assigned to it, whilst the two Assistant Aide Majors and two of the company commanders were all Maltese. y 1798 the Regiment of Cacciatori had expanded again to about 1,200 men, and employed in policing duties in the villages as well as sentry duties in the cities and garrisoning Forts Manoel , Tigne and Ricasoli with other regular infantry units. 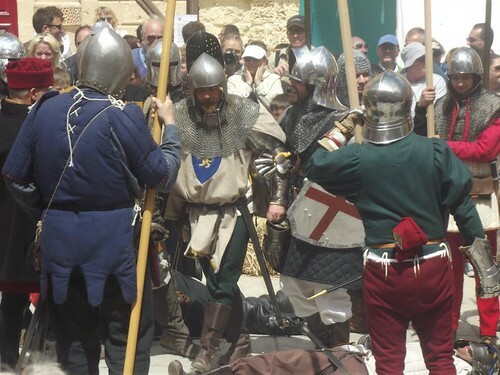 uring the French invasion, this unit repulsed attacks directed at the posts it was manning at Fort Tigne, Fort Manoel and Fort Ricasoli, surrendering only after the capitulation was signed by the Order in Fort Tigne and Manoel. Following the Maltese uprising against the French army of occupation, on 2nd September 1798, the Cacciatori did not answer to the call of the Republican Government to rally to the French colours. Some of it’s Pro-French officers were killed by the same men of the regiment, who joined en-block with the Maltese forces against the French. The Regiment of Cacciatori was formed in 1777 after a decision taken by the Chapter General led by Grand Master De Rohan. The best hunters on the island had already been known as the Cacciatori under the command of the Order’s Falconier, serving as gamekeepers in the Grand Masters hunting ground in Bosketto Gardens, since the early 1700’s. Now these men were to be recruited on part-time basis as a militia infantry unit of volunteers under military discipline. The officers, non-commissioned officers and drummers were to be appointed on a regular basis with their scale of pay fixed according to rank. Following the decision to form the Regiment of Cacciatori or as it was also known as the Reggimento dei Falconieri, hundreds of Maltese recruits joined this light infantry unit as volunteers, hailing from most of the island’s villages as well as the cities of Valletta and Burmola. In 1778 the Regiment was reorganized into four companies instead of five. This was due to a marked decrease in strength which had gone down to 522 all ranks. An Honorary Colonel was assigned to it, whilst the two Assistant Aide Majors and two of the company commanders were all Maltese. By 1798 the Regiment of Cacciatori had expanded again to about 1,200 men, and employed in policing duties in the villages as well as sentry duties in the cities and garrisoning Forts Manoel , Tigne and Ricasoli with other regular infantry units. During the French invasion, this unit repulsed attacks directed at the posts it was manning at Fort Tigne, Fort Manoel and Fort Ricasoli, surrendering only after the capitulation was signed by the Order in Fort Tigne and Manoel. Following the Maltese uprising against the French army of occupation, on 2nd September 1798, the Cacciatori did not answer to the call of the Republican Government to rally to the French colours. Some of it’s Pro-French officers were killed by the same men of the regiment, who joined en-block with the Maltese forces against the French.